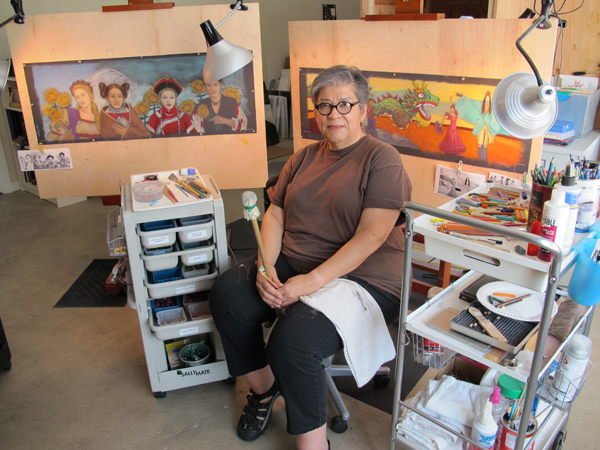 Artist Judithe Hernandez in her studio, with two of her original artworks for the Expo Line in the background. This is the fourth in a series of Source posts providing a behind-the-scenes look at the artwork fabrication process for each of the seven new Metro Rail stations under construction along the second phase of the Expo Line between Culver City and downtown Santa Monica. The artworks will create a welcoming environment for future riders and connect the stations to surrounding neighborhoods. Commissioned artists include Constance Mallinson, Shizu Saldamando, Abel Alejandre, Susan Logoreci, Nzuji de Magalhães, Carmen Argote, and Judithe Hernandez. This post introduces the artwork of artist Judithe Hernandez, which will be featured at the Downtown Santa Monica Station. Her original artwork, L.A. Sonata, began as chalk and oil pastel drawings on paper. Artwork Description: L.A. Sonata depicts a composite of global mythologies, a fitting gesture for the terminus station of the Expo Line, located at the very edge of our continent. The artist layers images to create metaphors for day and night as well as the seasons. By weaving cultural identifiers with elements that denote the passage of time, artworks create a sense of shared place and historical significance that honors the heritage of the local, the immigrant and the tourist alike. The pastel drawings were translated into glass mosaics from vivid cake glass, handmade by the artwork fabricator. 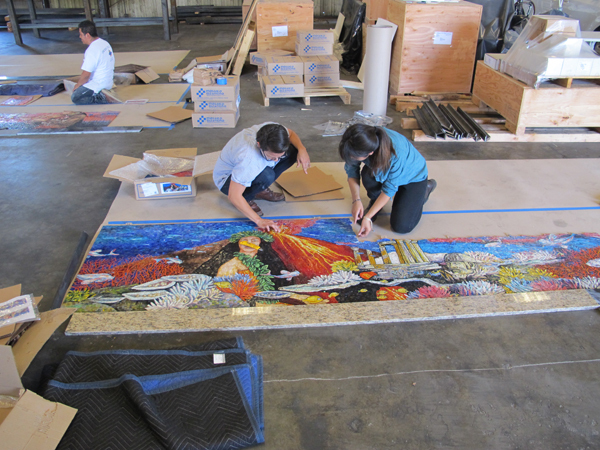 The 24 glass mosaic panels will be placed in steel frames and installed at the Downtown Santa Monica Station in highly visible places for riders and the public. 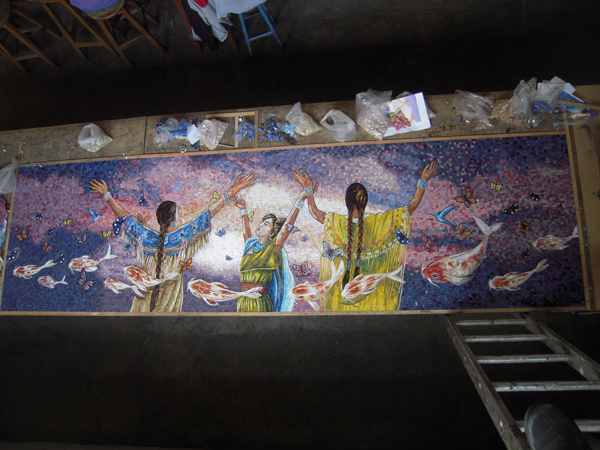 Hernandez is thoroughly involved in the process to ensure that the glass mosaic is an accurate translation of her original artwork. High resolution scans and scaled match prints of Hernandez’ artwork were sent to Perdomo Studio, an artwork fabrication branch of the mosaic glass maker, Mosaicos Venecianos de Mexico. The fabricator printed the electronic files at 100 percent scale to be used as full size layouts and in developing a full custom glass color palette. 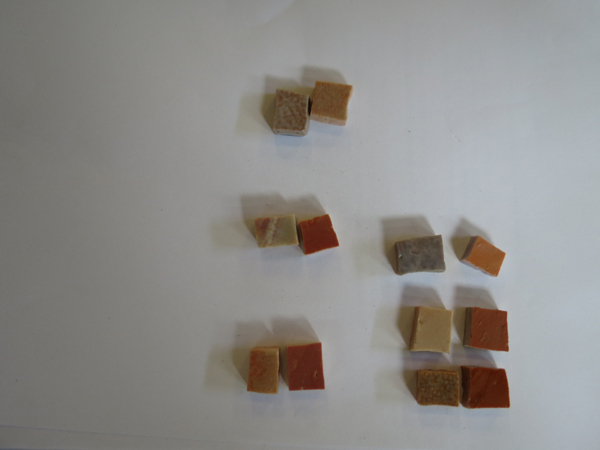 After the color palette was reviewed and approved by the artist, Perdomo cut the hand-made glass into mosaic sized pieces and assembled them using the full scale scans of the artist’s drawings as a guide. 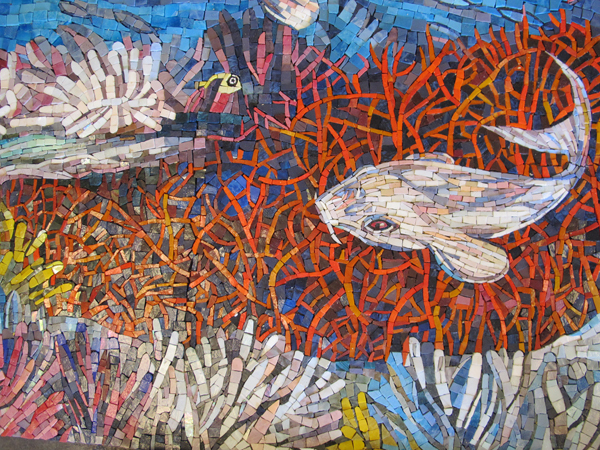 Click here for more information about the artist and here about her work for Downtown Santa Monica Station. 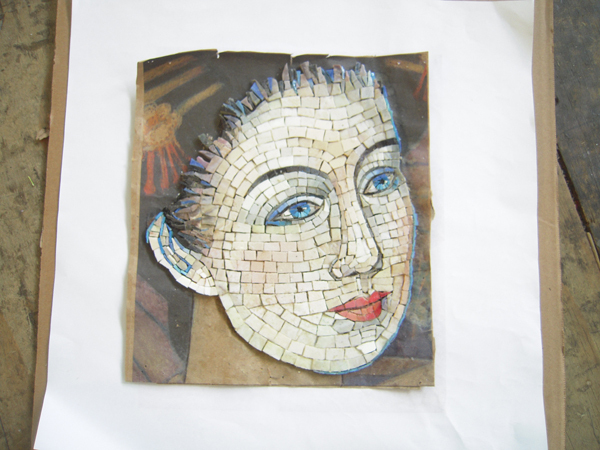 Glass mosaic pieces known as smalti are hand-made by the artwork fabricator to match the colors of the artist’s original pastel drawings. Photo courtesy Perdomo Studio. 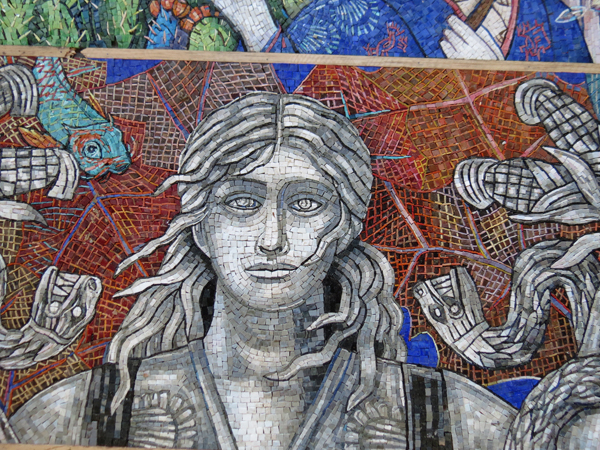 The two photos above show the assembly of thousands of glass mosaic pieces to match the artist’s original drawings at the fabricator’s shop. The high resolution scans of the original drawings are visible underneath. Photo courtesy Perdomo Studio. 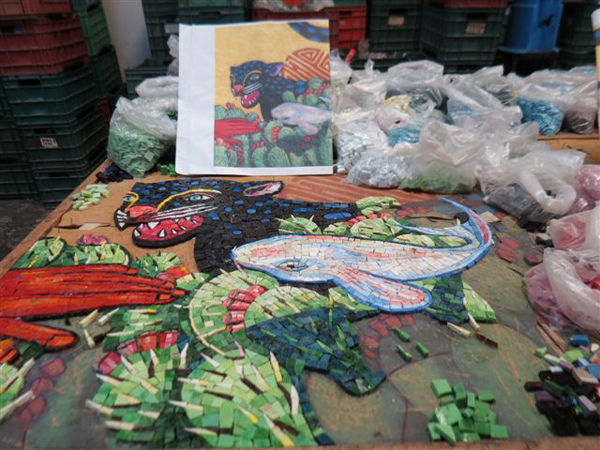 A view from above an artwork panel completed by artisans who hand assembled thousands of mosaic pieces that are pictured in nearby bags. Photo courtesy Perdomo Studio. Metro Art Manager Angelene Campuzano, assisted by Metro Art Intern Janet Le, carefully inspect the artwork panels from the fabricator at the workshop in L.A. where they will be assembled into painted steel framed panels and readied for delivery to the station. 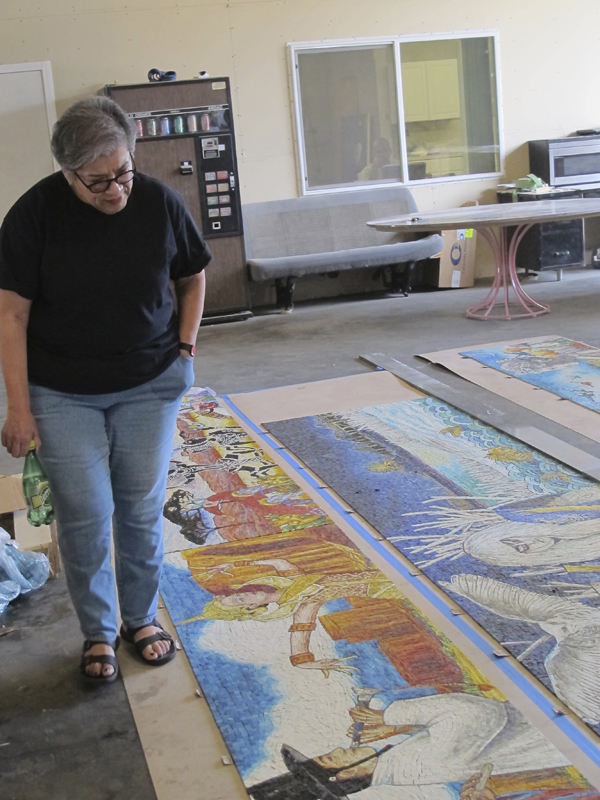 Judithe Hernandez inspecting her artwork panels after they were delivered by artwork fabricator Perdomo Studio to ensure that the colors of her original artwork are accurately reflected, and that the color is consistent among all 24 of the panels. The photos above show details of two completed artwork panels.